Drought, pests, and heat are stressing trees in Southern California communities. When the Santa Ana winds start gusting in Southern California, the air blows hot, dry, and hard. Even though the winds are a regular feature of the region’s weather, their first blast last October startled Tesia Villegas, who lives in Covina, California. Trees and branches crashed to the ground. A downed tree fell onto a neighbor’s house. “I actually have never really seen anything like that,” she said. During a heat wave in nearby Los Angeles last year, Dorrit Ragosine observed another problem with trees in her neighborhood: Their leaves turned crunchy and brown, leading her to wonder whether her trees will survive if temperatures keep rising. Natalie van Doorn, a research ecologist with the U.S. Forest Service, said that many of the trees commonly planted in urban areas in California are temperate species that require a lot of water to survive in hot and dry conditions. “The concern is very real that the current species that are living in the urban forests are not going to do well in the changing climate,” Van Doorn said. And it’s a problem not limited to Southern California. Across the U.S., metropolitan areas may lose an average of 6 percent of their tree species as warming trends continue, according to a 2016 study by researchers at the Georgia Institute of Technology. Reviewing Villegas’ observations of wind damage and Ragosine’s scorched leaves, Alison Berry, a professor of plant sciences at the University of California-Davis, said that drought stress was likely a bigger factor than heat. California has been in a drought since 2011, with many areas getting a brief respite in 2017. 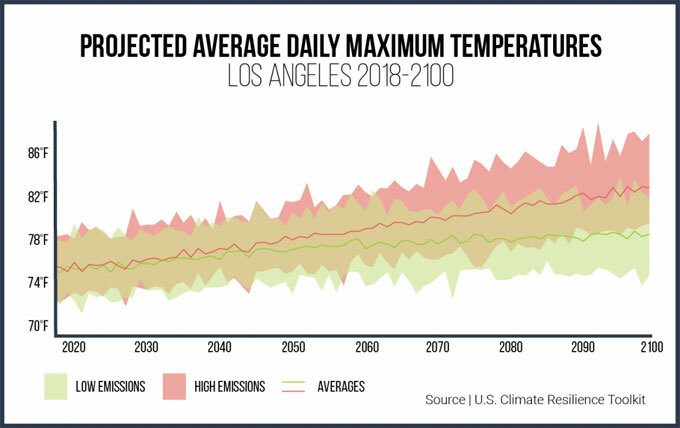 The Los Angeles area is again experiencing drought, and human-caused warming is contributing to “warm temperatures, dry soils, precipitation deficits, and low snowpack,” according to California’s Fourth Climate Change Assessment. Drought is a major concern in the area not just because it dries out urban trees like those in Villegas’ neighborhood, but because it also leaves the surrounding landscape vulnerable to major wildfires. One month after Villegas’ observation, the Woolsey Fire, the worst wildfire in LA’s modern history, ignited in the grassy hills west of her neighborhood. And farther inland, drought has put the forests of the Sierra Nevada Mountains at risk. An aerial survey found that over 100 million drought-stricken trees died between 2010 and 2016 in the southern and central Sierra Nevada Mountains. Arborists in the Los Angeles area report seeing increasingly stressed trees. James Komen, a board certified master arborist, has observed trees damaged during extreme heat waves. 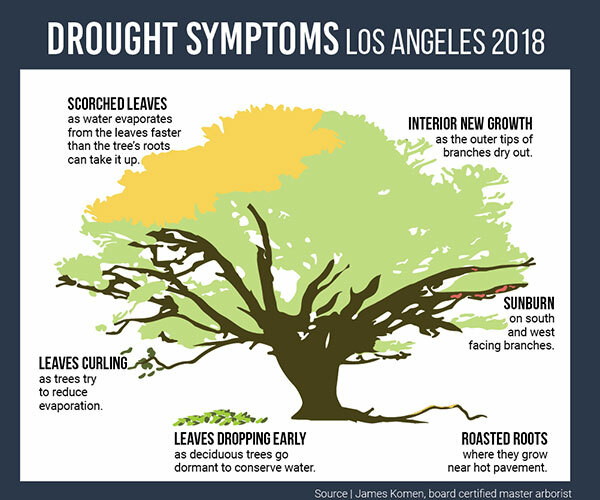 Adding to the stress are pests like the pine bark beetle and the shot hole borer, which take advantage of drought-weakened trees, said arborist Karina Nordbak at Tree Care LA. A Forest Service scientist has warned that the shot hole borer alone could kill 38 percent of trees in Los Angeles, Orange, Riverside and San Bernardino counties. Many municipalities are planting more trees in the hopes of countering extreme heat, controlling flooding, and capturing carbon emissions. To prepare California’s urban forests for climate change, foresters and scientists — including Berry and Van Doorn — joined forces in a project called Climate Ready Trees. The project was started by Greg McPherson, a now-retired research forester with the Forest Service’s Pacific Southwest Research Station in Davis, California. McPherson began thinking about the question of preparing urban forests for drought when he was working at the University of Arizona in Tucson during a drought in the 80s. “Before my eyes, it transformed from a city where there were a lot of grass lawns and a lot of irrigation to one that was really more of a desert landscape,” McPherson said. When he later moved to Northern California, he began mini-experiments with drought-tolerant trees to see if any of them would thrive. That ultimately led to Climate Ready Trees, a 20-year study launched in 2014 that spans three climate zones — Northern California’s Central Valley region, a coastal Southern California region, and an interior Southern California region — with a dozen experimental tree species planted in each zone. 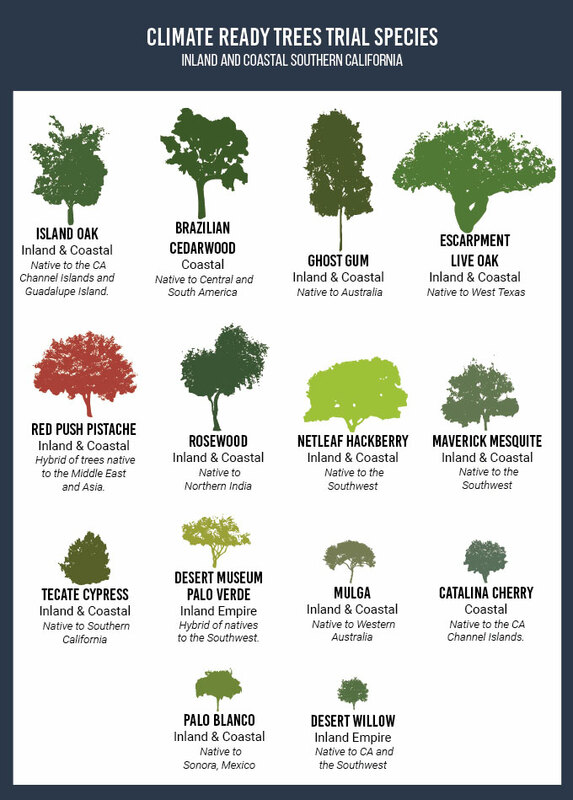 The trial species include trees native to drier regions of the U.S., like Arizona, Texas and Oklahoma, as well as trees native to islands off the coast of California, and as far away as India and Australia. Throughout the duration of the study, researchers will regularly score each species’ ability to handle 10 variables, including soil conditions, temperature, wind, light and water availability. The Southern California trees were planted only three years ago. As such, Van Doorn said that it’s still too early to know which species the project can recommend. Van Doorn said that members of the public and urban foresters are already asking for guidance. Back in Los Angeles, Ragosine is among those looking for answers. Two of her California black walnut trees have died, and she’s observed wildlife and insect populations declining. As winter sets in, she hopes for cooler temperatures and rain to bring relief. Story and graphics by Samantha Harrington for ISeeChange in partnership with Yale Climate Connections.